Mac vs Windows. Windows vs Mac. Why choose if you can get the best of both worlds by dual booting? Install Windows on Mac so you can jump back and forth from one operating system to another on the same computer. By now, the practice is well-established and Windows can work on Mac well. 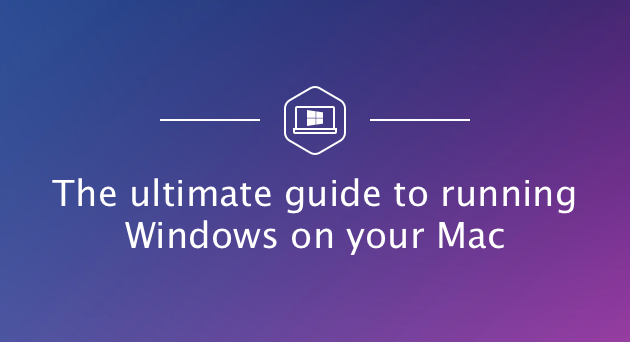 In this article, we’ll have a deep look at installing Windows on Mac. Don’t worry, we’ll have your back the whole way through! If you want to install Windows on your Mac, you have two options. You can either use Mac Boot Camp, a native feature of the macOS operating system, or you can use a third party virtualization program. Both methods have their own pros and cons, so let’s dive in. Boot Camp is built into the operating system of all Macs. If you go to your Applications > Utilities folder, you’ll see the Boot Camp Assistant app. It makes the separate partition on your hard drive for installing and running Windows. Once Windows is installed in Boot Camp, every time you turn on your Mac, you will be asked to choose the operating system you want to run. This means that in order to switch from macOS to Windows, you need to reboot your computer. Virtualization programs are third-party applications that allow to install a separate operating system on one machine. They run like any other app on your Mac, so you can see the entire Windows desktop within a window on your computer. Among the most popular virtualization programs are VirtualBox, Parallels, and VMware. Each one has its peculiarities, but we’ll try to sum up what they have in common. Depending on your specific needs, you can choose the option that works best for you. But we suggest using Boot Camp. It’s a free native feature of your operating system, running directly on your hardware. Therefore, it will be faster than any other method. And below, you’ll find all information on how to run Boot Camp on your Mac. Some versions of Windows require a certain processor and more hard drive space than the others. Therefore, you have to check the documentation that came with your copy of Windows to learn what you need. You need to have at least 55 GB of free disk space on your startup drive for installing Windows on a Mac. 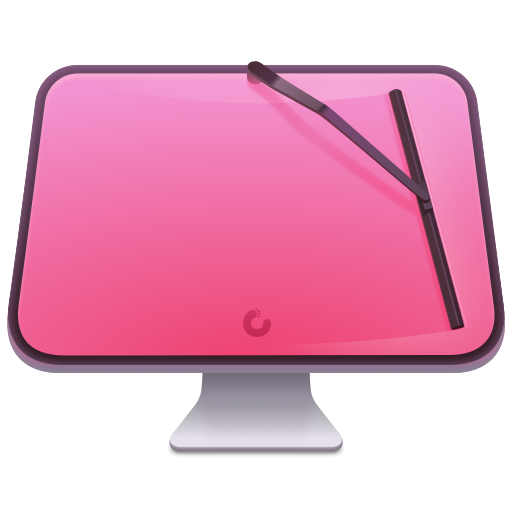 And if you don’t feel like spending the next several hours cleaning your Mac manually, you can use a powerful utility CleanMyMac X to find and remove all the junk from your startup disk. 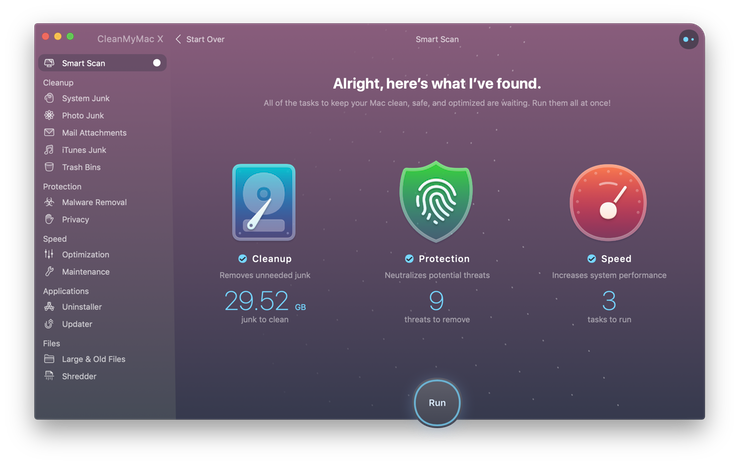 CleanMyMac has everything to finish the 3-hour task of cleaning your hard drive in less than 5 minutes. It will scan every inch of your system and remove gigabytes of junk in two clicks. By the way, CleanMyMac finds about 75 GB of junk on average — more than enough for a smooth Windows installation. Run the app and click Scan. That’s it! Gigabytes of junk are gone from your computer forever. Finally, you should also perform a backup of your Mac in case something goes wrong. Although, it happens very rarely, it’s always better to back up your important data. There are a few methods of backing up your Mac, so choose the most convenient one for you. You can make automatic backups with Time Machine — software that comes with your Mac. It backs up all data, so you can recover individual files or your entire system from your backups. You may also store files in iCloud and access them whenever you need. iCloud comes with 5 GB of free storage but you can upgrade it any time. If you have an external storage device, you can copy some files and folders on it. We do recommend you to back up your Mac before installing Windows as it minimizes the chance of losing important data. Here’s how to install Boot Camp. The installation can be a little time consuming, but it is by no means difficult. Check out the details below. Visit the Windows 10 disk image download website. Go to the Select edition menu and choose Windows 10. Choose the language of installation and click Confirm. Click 64-bit Download and then click Save. The ISO file now will be downloaded to your Mac. Boot Camp Assistant guides you through installing Windows on your Mac. You just have to follow the onscreen instructions. To launch the Boot Camp Assistant, go to Applications > Utilities folder. Click continue and Boot Camp for Mac will automatically locate the ISO file on your system. When you are done with the Assistant, your Mac restarts to the Windows installer. When you are asked where you want to install Windows, choose the BOOTCAMP partition and click Format. *Note that this step is only required if you’re using a flash drive or optical drive to install Windows. In other cases, the right partition will be selected and formatted for you automatically. Choose your ISO file and click the Install button. Type your Password and click OK. You will see the Windows Setup screen. Type your product key if you have it. Otherwise, click "I don’t have a product key". Select Windows 10 Pro or Windows Home and then click Next. Click Drive 0 Partition X: BOOTCAMP. Click Next. Windows 10 will be installed. When the Setup screen appears, click either Use Express Settings or Customize Your Installation. We recommend you to choose the Customize button and disable most, if not all of the switches. Then you’ll be asked to create an account. Type a username. You can also add a password if you want. Choose whether you want to use the Cortana personal assistant or not. You can disable it by clicking Not Now button. Windows will boot fully so you can use it normally. On the Welcome to Boot Camp Installer box, click Next and accept the terms in the license agreement. Then click Install to proceed. When the installer completes, click Finish to reboot your machine. By default, your Mac will still boot to macOS. To access Windows, you have to turn your Mac off and then turn it on while holding the Option (Alt) key. You will be asked from which drive you’d like to boot. Note that while in Windows, the Mac’s Command key functions as the Windows key, while the Option key functions as the Alt key. If you have a Touch Bar, you’ll see a complete set of buttons, similar to the Control Strip in macOS. Boot into macOS, launch Boot Camp Assistant and click Continue. Choose "Remove Windows 7 or later version" or "Remove Windows 10 or later version". Click Restore when you see the Restore Disk to a Single Volume option. The Boot Camp Assistant will automatically remove Windows from your Mac. Warning: All data, including software and files, stored on the Windows partition will be deleted, so make the backup copies first. That may seem like a lot of steps, but it doesn’t take all that long to install Windows on a Mac. Now you can enjoy two operating systems and switch between them right when you need. Cheers!